Felkerino said that today is when the mountains embraced us. I said it was a day of bike tour magic. Part of the reason for that, of course, was the beautiful climbing on the Million Dollar Highway for the first 38 miles. 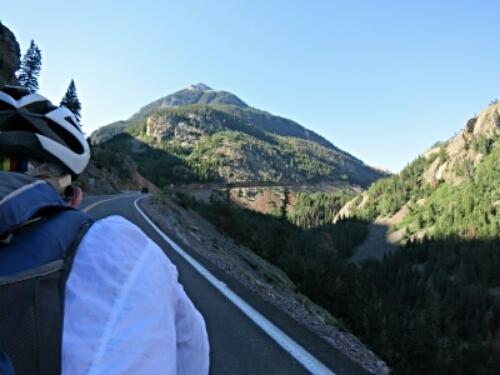 We ascended from Ouray at 7,800 feet to over 10,000 feet and crossed three passes in the first half of our ride: Red Mountain; Molas; and Coal Bank. The other reason we felt so inspired by our day was the people we had the chance to meet. We were held up at the top of Red Mountain Pass because of road work (blasting!) and chatted with several people touring the area (in their cars, but I guess it’s okay this time). We flew into Silverton, where the town was preparing for the Hardrock 100, which starts tomorrow. It was bustling! We had excellent espresso at Mobius. We talked to a couple of the ultrarunners and met a couple from California who were out mountain biking the area. We exchanged bike stories and Felkerino even test rode one of their bikes. 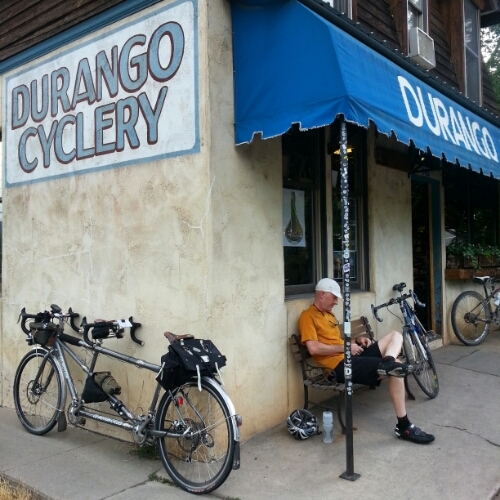 More steady climbing over Molas and Coal Bank Passes until mile 38, when we began our big drop into Durango. The road was mostly peaceful going up, and all drivers gave us plenty of room when passing. 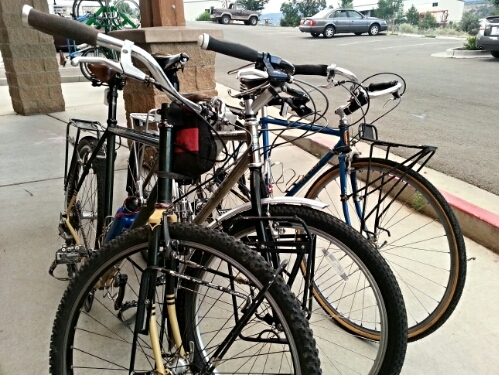 In town, we stopped at Durango Cyclery (a shop full of bike treasure) and ended up going to dinner with some people there. That’s bike tour magic! I’m tired so I’m not doing the best job of explaining the magic of this day. Weather was good and our bodies seem to be settling into longer climbing efforts. That could also be the payoff from our rest day, too. The grade of the highway was also not as steep as Felkerino and I thought it would be. The vistas were intense, and I wasn’t even freaked out by the sheer dropoffs while leaving Ouray. Progress! From beginning to end, I felt welcome. Lots of people talked with us about our tour, and we had so much fun chatting about bikes, routes, and touring. I don’t know why this day was so interactive. Maybe it’s the vibe of this area or maybe we’re coming down with the blabs, I’m not sure. It was an awesome day, and I’m attributing it all to bike tour magic. Thanks for the description & photos. 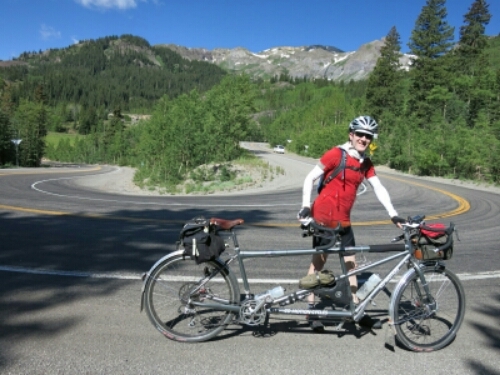 My wife and I did this route on a 1982 tour that also took us through southern Utah (just the two of us with panniers). It was a cold September and mountains were obscured by clouds and too much rain and snow. Went back by car many years later with our kids and backpacked in the nearby Weminuche Wilderness. Finally got to see those marvelous mountains. Love your posts. Thanks for following along! Wish I was still bike riding, but it’s good to be home, too. It sounds lovely. You two are climbing beasts! Congratulations. My sister lives in Montrose and we have driven Red Mountain Pass, a white knuckler even in a car. You guys are an inspiration. 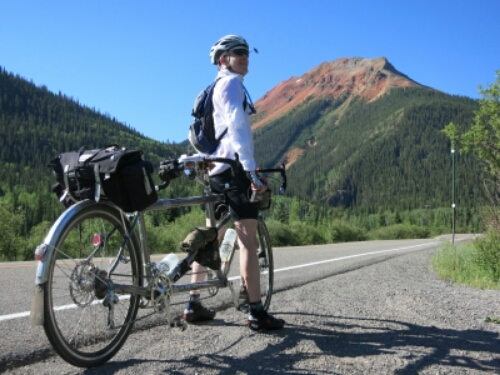 Still miss my home state, but Montana has many great things to offer cyclists of all stripes. I’ve driven that exact route but reverse direction, from Durango northward. It’s beautiful. I’m so impressed you’d bike it! Even my car thought it was steep, particularly the hairpins with sheer drop-offs from the pass down to Ouray. 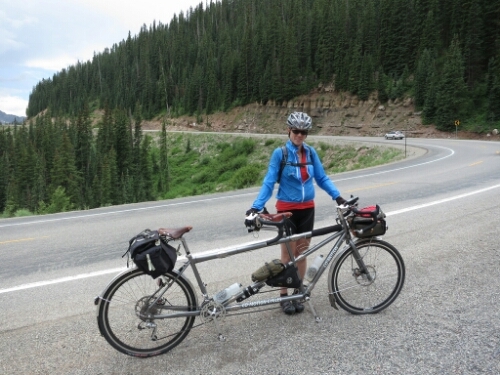 Climbing *that* on a bike is awe-inspiring. Well done and thanks for sharing with the rest of us!